Join the discussion on our forums! Come discuss Hammer of Twilight over in our dedicated Hammer of Twilight discussion topic. Deathrattle: Summon a 4/2 Elemental. Stop! It's Twilight Hammer time. Just droped it from pack. Will it work with elementals since it summons elementals not play them? 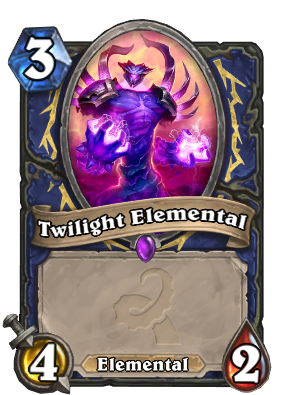 If elemental decks are strong after Ungoro, this should end up quite strong for midrange shaman, you'll see ! Flavor text straight out of Kung Fury dudes!! The Golden Animation is sick! The art is so amazing. Wish this was used on a card of its own. Good Nostalgic moments. This Weapon was one of the best healing weapons for Cataclysm from the first tier raids. It dropped from Choggal in Bastion of twilight. Bit weird that they don't add a healing value like its original form. Anyway I really like the current value. Its true, you could use it also for dps but you had also other options like stuffs if you played shaman. Instead the Holy Paladin had only this in Cata and then the hammer from Nefarian. why are people acting like deaths bite and truesilver are bad cards if they aren't played exactly on turn 4? 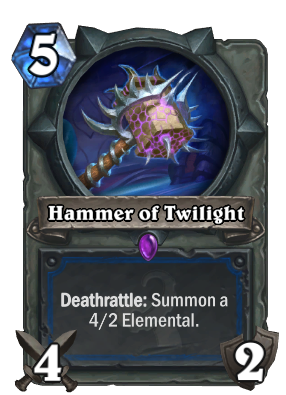 Well Truesilver Champion (4, Basic card), Death's Bite (4, Common card), Hammer of Twilight (5, Epic card) and shaman already have 2 other epic weapon ... Still like the card, but it could have cost 4 and being rare. Maybe it is to avoid some kind of "Turn 4 Hammer, Turn 5 Doomhammer ..."